A minimalist puzzle-platformer series starring Qbby. Qbby can produce strings of connected boxes from his body, creating shapes that he can use to climb around, form stairs and shield himself from danger. 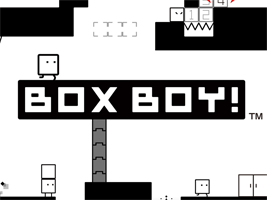 The BoxBoy series was developed by the Kirby team at HAL Laboratory.